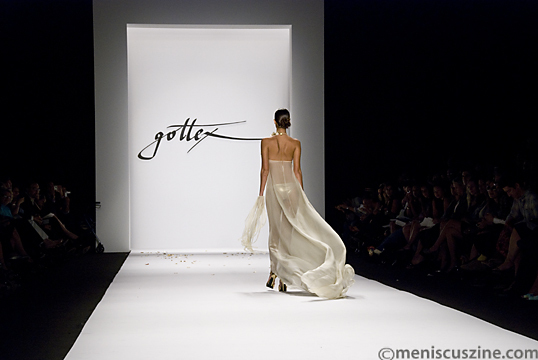 Before writing this Gottex Spring 2009 show review, I was just a little curious about what others had to say about the new collection. I was genuinely disappointed by The New York Post’s review; please pardon me for calling it “clueless gibberish,” mainly because the reporter didn’t do her homework on the brand and seemed to have no clue about the essence of the Gottex style before reviewing the show. Just a couple of minutes spent reading the “What Makes A Gottex” section on the high fashion swimwear company’s Web site would have been sufficient enough for getting an idea of what this famous Israeli swimwear line represents. Yes, those neon sleeves are for show and yes, that is one of Gottex’s signature looks incorporated into each collection every year. Brooke Shields, Sharon Stone and the late Princess Diana have all reportedly made a splash with Gottex prints and colors, and it is easy to see why. Inspired by the lavish colors and textures of the Mediterranean, many of the halter, high neck, off-the-shoulder and bandeau swimsuits featured gold chains and 18-Karat gold ribbon detailing. The looks were accessorized with matching pareos and open caftans, black or gold peep-toe platform shoes, oversized floppy hats, stackable bracelets, and bright multi-circle earrings. 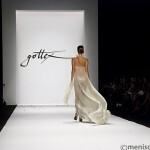 This almost architecturally-designed collection featured several themes. Starting off on a nautical note, Oberson showed black and multi-colored bikinis and monokinis. These either incorporated bold gold and black anchor and cut-out detailing, or were directly manufactured from anchor print black and white fabric. Making a statement with one-pieces and bikinis in solid black, neon orange, pink and green, Oberson showed attention to detail with his skillful utilization of 18-Karat gold ribbon, gold chopsticks and graduating circles, combined with daring, inventive cutouts. Other memorable swimsuits portrayed sunburst motifs and multicolored flower prints. The show ended on a high note with a Hollywood glamour theme in snowy white with swimsuits featuring delicate draping, bindings and oversized buckle belts. Gottex swimsuits are made in Israel from imported Italian fabrics and run about US$150-$200 (for the designs without gold). This Spring 2009 collection, by the way, is already on pre-order at select stores.